From the wedding of Sue and Jen at Snape Maltings in Suffolk. "Thank you Gavin, we had an amazing evening - #brilliantDJ". From the wedding of Janice and Barry at The Broadway Hotel in Letchworth, Herts. "Gavin is a warm and friendly person and very professional. We gave him a list of all the songs we wanted played throughout the day and advised him off the type of music we didn't want to be played. He was extremely receptive to all our requests and everyone had a great time. We couldn't have asked for more". From Patricia's 50th birthday party at Play football, Colchester, Essex. Just wanted to thank you for making my party so very special, everybody said what a great time we all had. The music you played was just exactly what I wanted and I had a great time dancing! Many thanks. Kind regards Patricia ". 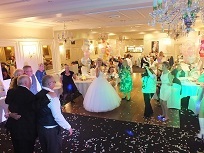 From the wedding of Paul and Anna at County Hotel, Chelmsford, Essex. We now would like to say a huge thank you! You were more than perfect - very helpful, friendly and professional. I am particularly happy with the email exchange with you - you always kept me well informed and dealt with things quickly and efficiently. You put my mind at ease all the way till the wedding. We were very happy and the guests too. All the best for the future - hope to see you again at another event! "Thank you Gavin you did a great job at our wedding the guests had fun and you seemed to be able to play the right music for the dancers ! We loved the bubbles and the photo booth was a great hit! Thank you very much Lynda and Peter "